Subscribing the bimonthly Motorcycle classics Magazine could be the best way to celebrate the style and beauty of the vintage motorcycles. 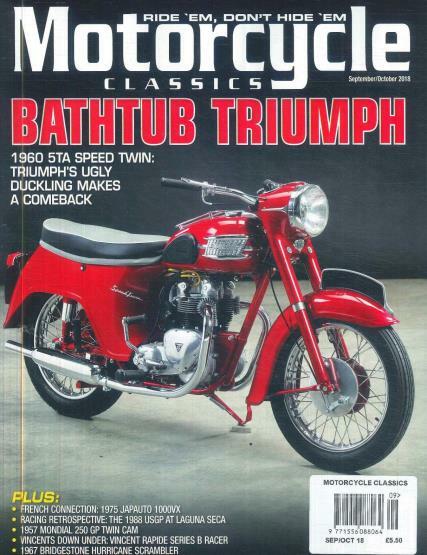 Buy a single copy or subscription to Motorcycle Classics magazine. If you are a lover and the proud keeper of the classic motorcycle, you would surely enjoy the informative and interesting articles on the classic motorcycles and their owners. The age group of classic motorcycle lovers varies to be from 20 to even 60 or more years, that is why the Motorcycle Classics delivers useful information and news that is relevant for every age group. The newer generation has the hobby to collect the classic motorcycles and they are all geared up to keep them in perfect shape and condition. To guide them through their endeavor, the magazine features tips, practical workshops and rebuild projects. This magazine can also help to buy the best vintage motorcycle that is equipped with powerful, unfiltered motorcycling and high noise. The buying guide has the trusted information and recommendations pertaining to various vintage models, their manufacturing dates and other distinguished features.